Don’t let another summer go by without having your dream cabin. If it’s time for you to get a log cabin to enjoy in the summers with family and friends, Wayside Lawn Structures has some awesome log cabins that are perfect for many purposes. They have smaller 10 foot by 14-foot log cabins like the Hunter log cabin that start at around $6,000. 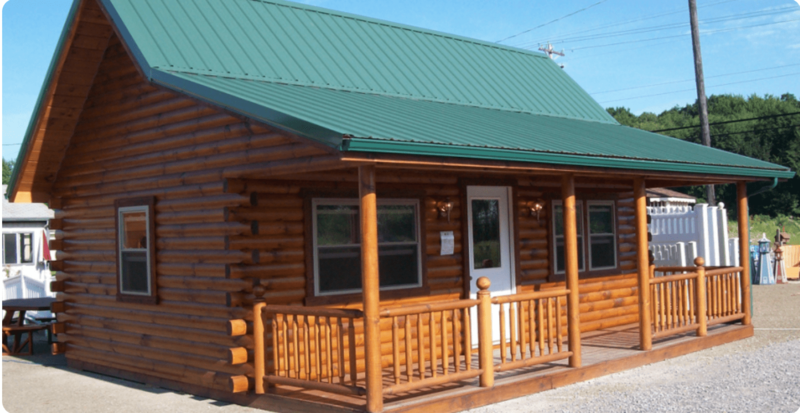 Plus, they also offer two to four-year financing on all of their log cabins and customers can build their own log cabins easily thanks to the help of their complete building packages. For a fee, the builders at Wayside will also help you build the cabin or even build it entirely for you. Imagine spending your next vacation way out in the woods with a special someone or the whole family and some friend. These cabins are great, they range in size, complexity, and price, so it’s easy to find a unit perfectly tailored to your individual needs. The standard features of every Wayside cabin include thirty-year shingles, a durable steel roof, Perma-Chink staining, tongue and groove floors and a loft above the porch. On top of that, Wayside offers a number of different features that can be added onto the standard package. For example, you can add on lofts, screened in porches, insulated floors and roofing, timber-framed gables Thermopane windows, railings and seamless gutters. You can also choose the perfect colour for your cabin as the staining is available in bronze, chestnut, cedar, caramel, and almond. You can get as specific as you want and customize to suit your needs and style preferences. You might as well like it from the start because you’ll have this cabin for a while because they’re built to last. In their cabins like these models in the Deluxe Log Cabin Series, you have just enough room to relax and enjoy nature, without it getting too expensive. All you’d have to bring is some food, water and anything else you like to have when you’re vacationing and enjoy. The Sunrise cabin from the Deluxe Series of log cabins includes a design with 17 Rows of 4×6 Logs with a 12/12 Pitch Roof, 2-inch thick Treated Floor, 4×6 Rafters, 4×10 Ridge Beam, 2-inch Sheathing and a loft above the porch or a loft within the home. The look of this little log cabin is nice and small with a great porch on the front of the home making it perfect for enjoying the outdoors from the comfort of your own cabin. Inside, there is just enough room for an open living space including a living room, dining area and kitchen. Then the loft would make for the best sleeping area. Wayside Lawn Structures knows what they’re doing when it comes to making some of the best log homes and buildings on the market. They’re based in Columbiana, Ohio and have been serving the Tri-State area since 2002. In that time, they quickly grew from a small corner lot into the leading log cabin and structure builder in the area. Not only do they build log homes and cabins, but they also build playsets, sheds, storage units, gazebos, furniture, pergolas, decks and fences. This is a company that loves to help their customers get exactly what they want and need in a log cabin or home, so if you go through them for your log cabin, you’ll be well looked after. You can even just get a lot of inspiration from their log cabin models and see what style and design concepts you like the most. Before you know it, you’ll be in a log cabin of your own.